Retractable display area slides into a thin body with tactile rubber buttons. 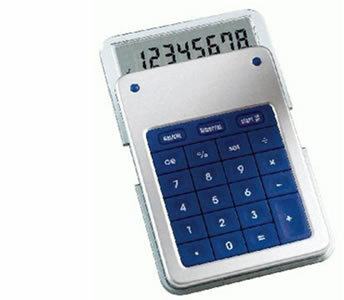 A bushed metal print area and foldaway stand makes for an ideal desk calculator. Clock, stop watch, alarm and count down function. The perfect office accessory. Can be printed up to 4 spot colours and can also be laser engraved for a more lasting impression at an additional cost. Battery included. Price is inclusive of a one colour print in one position. There is a screen setup cost of £27 per colour. Design / artwork creation is FREE on all orders over £600. All prices are subject to VAT and delivery at cost.